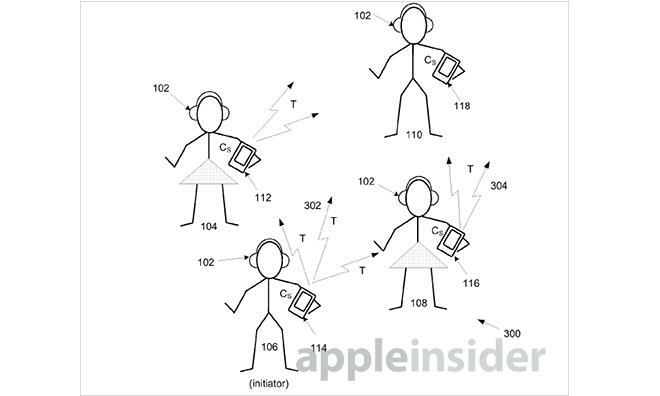 A somewhat offbeat patent awarded to Apple on Tuesday describes a method of providing iOS users with a 'silent disco' experience, where musical characteristics sampled from a roving DJ's track trigger playback of similar tunes on a local device. The U.S. Patent and Trademark Office on Tuesday granted Apple U.S. Patent No. 8,521,316 for a "Coordinated group musical experience," which details the "[s]haring of a music experience amongst a group of people each using a personal communication device," such as Apple's iPhone, iPad or iPod. The technology is loosely based on so-called "silent discos," in which a group of people come together as they would any conventional concert, but listen to a DJ's music with headphones instead of loudspeakers. Unlike silent discos, the music does not have to necessarily be the same song, or even from the same genre. Instead, musical characteristics such as tempo are sent to other users' devices, which in turn find stored music that most closely matches the DJ's track. Each person should only hear their own music for the full private listening effect. While the music may not be shared, the method isn't quite "mobile clubbing," a private group listening get together where location is the main thing participants have in common. 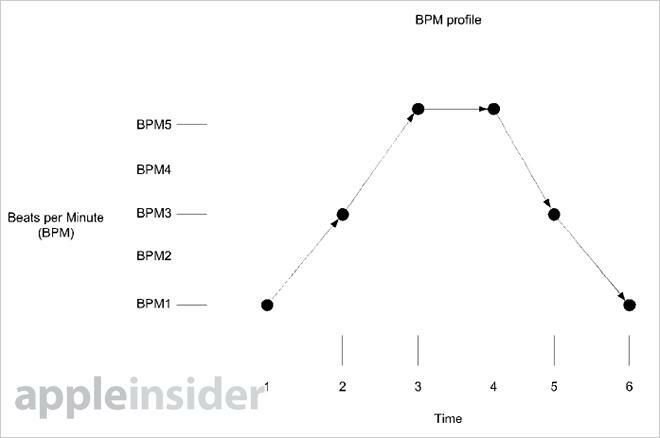 Illustration of a beats per minute profile. Some situations may call for a rotating DJ, meaning other users can participate as initiators of music selections for the group. One of the more interesting scenarios is when the music manager, that is the app controlling media playback, adjusts the tempo of a track on the fly. This audio tweaking can be done to meet the beats per minute requirements set out by the DJ's song choice or whatever determined characteristics are guiding the session. Finally, the patent notes that the system can be contained in a single app downloadable from the App Store. While novel, the invention's use cases are somewhat murky beyond impromptu parties in noise regulated areas. The social aspects of the patent are interesting, however, as Apple has yet to successfully connect its massive base of iTunes users on a unified networking platform. Apple's silent disco patent was first filed for in March 2010 and credits Sylvain Rene Yves Louboutin as its inventor.